Anglers have long cast lines in Jackson County’s rivers for trout, small mouth bass, and muskie. And since 2009, when the only nationally designated fly-fishing trail was established here, the area has lured the attention of even more sportsmen. 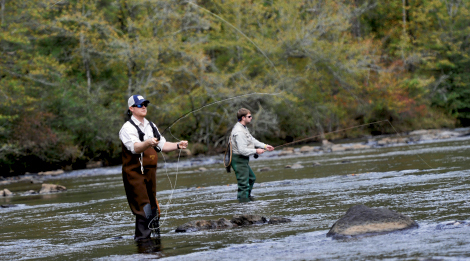 This year, the county hooked its biggest catch yet: the Southeastern Fly Fishing Festival. Western Carolina University hosts the festival May 17 and 18, when attendees can choose from more than 20 hands-on classes and presentations. There’s even a chance for beginners to slip into waders and head into the river. Some 40 fly-tying stations and multiple casting workshops educate the novice and pro, and youngsters can show off their skills during a fly-fishing tournament. Attendees can also support brook trout restoration in Great Smoky Mountains National Park during Back the Brookie BBQ on Friday, followed by a screening of selections from the 2013 Fly Fishing Film Tour. A banquet dinner and auction on Saturday are additional bait.